It’s a bit late in the day to thank my wonderful class last Saturday but thank you guys, the day was a blast and such fun it shot by in a whiz. Suddenly we’re at Wednesday already and not quite sure how we got here! I’ve got a shortened week this week as a long weekend beckons in Paris on a buying trip so squishing 5 days into four, hence its a little crazy and hence I forgot my thank you’s. Sometimes designing a room can feel a little intimidating. Where to start? What scheme to run with? What to choose? Something I do a lot is break the space down into sections. First of course you’re going to have to figure out the palette on the walls but once you’ve nailed that rather than working on the whole thing in your head start small, section a room out. 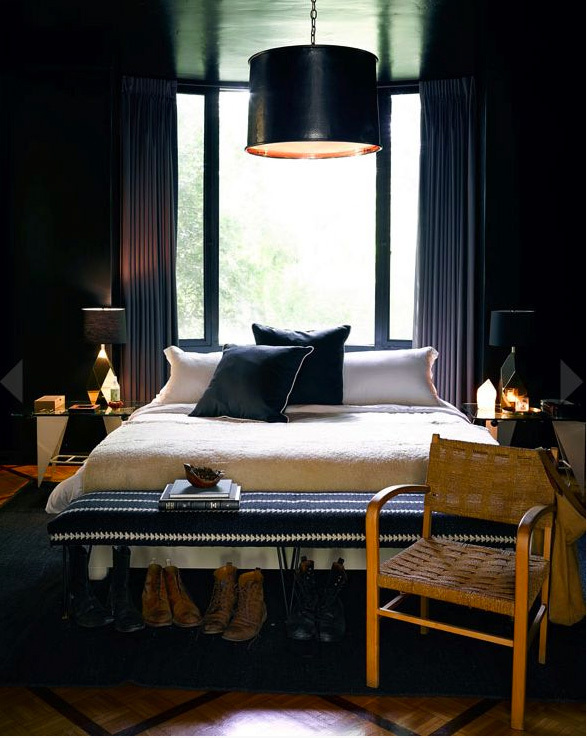 Take this bedroom below belonging to Nate Berkus. Once the bed is in place its the details that turn it around. So you’ve got the bed now lets think of the stuff going at the side. Two tables not just practical but they add those all important layers. Add lamps a heap of books and suddenly you’ve got a cute little detail. I wouldn’t match my lamps and tables but hey its you’re home you can do as you want! All I would say is the more matchy matchy you go the less intriguing a space looks. Anyways I digress, check out the upholstered bench plus the chair at the end of the bed. Most of us wouldn’t think to put a chair there but when you design in sections it’s far easier to think of such things, you push it more. Its far more intriguing, far more 3 dimensional than just going with the bench. So zero into the sections of a space, small sections rather than worrying about the overall thing as a whole. I find it easier and less daunting. Another image to break down this time a living room. Sofa’s backing walls are a no no and soon to be a criminal offence (should I be PM anytime soon)!. But look what happens as soon as you move it a smidge into the room and put a console or shelf behind. Magic happens! You are creating layers and the more layers you create the more tantalising your space will feel. 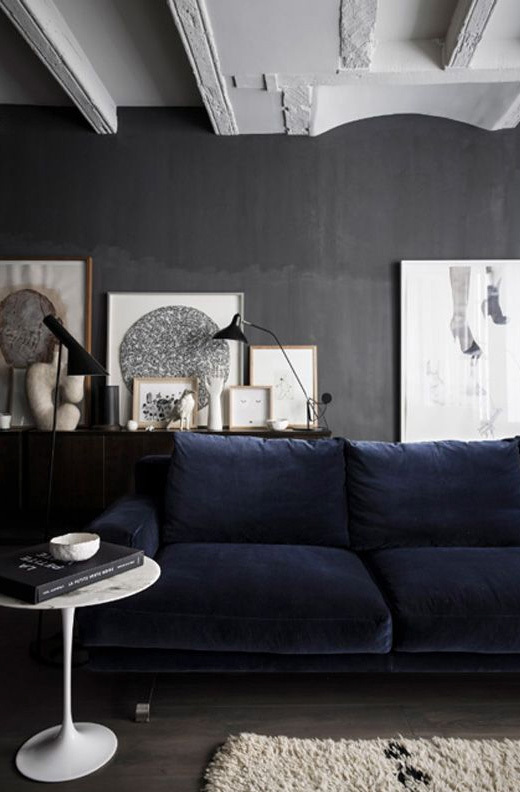 Layer it up with paintings and lamps and its fab no? Decorating the AA way if I can call it that is all about eluding the eye, tricking it so when you walk into a space your eyes don’t quite know where to look or stop off. Subconsciously this heightens the senses so you’ll feel far more excited and bewitched walking into a room like these than walking into a space with not much in it! Plus when you stand back and look at you’re completed room as a whole it will look beyond fabulous because so much thought has gone into each and every detail! I just love these rooms. I have a couple of rooms in a cottage that I have painted All White in F&B and I was thinking of painting Down Pipe (Love this F&B colour) on the wall behing the bed and behind the sofa. Do you think it would be too harsh agains the All White??? Will start with one and see how we go. Can’t wait to see how it turns out. So kind if you to say thank you so much. Glad the naughty tin is working out also oh and best wishes with the revamp, how exciting! 🙂 I’m revamping my small front room in downpipe. I have a major dilemma. Have two, fabulous dark red leather sofas…. BUT… backed against the walls!! There’s no space behind them for a cabinet, book case..!!! Help, what do I do? I wounder if you could put the skinniest shelf or console there, it doesn’t need to have much depth enough to maybe hold some art. Or Ikea do super skinny consoles I think the thing to remember is that you don’t need to worry to much about the floor space in the middle, in my pad there is hardly any. Great ideas. Thanks so much for your response. I’m on the case:) skinny shelf it will be. True… There’s no reason to be bothered about floor space in the middle. Love your work and excited to enjoy my new home!!! !